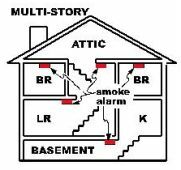 Effective March 31, 2006, every residential structure and dwelling unit with Fossil Fuel Burning equipment, (fueled by natural gas, propane, oil, wood, coal or corn) OR if it has enclosed parking shall be equipped with working and listed Carbon Monoxide Protection. Battery unit with low battery indicator. AC powered plug in unit with battery back up. AC hardwired unit with battery back up. Approved Low Voltage or Wireless detectors. for each and VOICE for the CO activation. NOTE: Detectors must be photoelectric type if located within 20’ from Kitchen or Bathroom. One detector on each level of habitation including habitable basements and attics. On the sleeping level the detector shall be located in IMMEDIATE VICINITY NOT to exceed 10’ from any bedroom door. Install detectors according to Manufacturer’s instructions. This may be more practical for LARGE buildings with limited or NO Fossil fuel burning equipment in each dwelling unit. What is required under the Alternative Option? 1. CO protection in all central fossil fuel burning equipment rooms and their adjacent spaces. CO protection is also required in adjacent areas of enclosed parking. 2. Detection shall be AC powered with Battery backup or low voltage systems. They shall be monitored to a constantly attended location and RETRANSMITTED to the Fire Department. 1. Must at a MINIMUM maintain, test, repair, or replace every CO detector upon RENEWAL of lease OR on an annual basis which ever is more frequent. 2. Batteries are to be replaced annually. The Health Department will be reviewing compliance with CO detector requirements upon inspection of rental housing either upon occupant request or in conjunction with “Certificate of Occupancy” inspections. The Health Department will refer reports of potential non-compliance to the Fire Department.